I'm spending time this weekend revisiting the notes and pictures I took while traveling to the wine regions of Spain for 10 days in early December. I've (finally!) downloaded pix from my Iphone, so here are some images captured "on the fly" as I traveled. 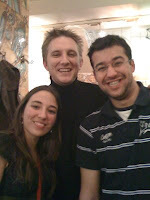 In Madrid, I first began speaking with Carlos (center), who turned out to be a sommelier. I wasn't sure if it was fate or luck that the first Spaniard I met was also an expert on their wine. He wrote out his list of the best Spanish wines: Vega Sicilia (this winery is legendary), Vina Tondonia, Fontal, Arzuaga, Beronia, and Rivola from Abadia Retuerta. Soon we were joined by his old friends Sylvia and David (the dark-haired guy) and we enjoyed a fun evening of wine, tapas and conversation. Thanks so much guys for picking up the tab--and I owe you a night out in NYC! 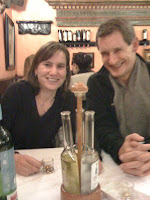 In Aranda de Duero I met Tom & Melanie--a couple of political science professors who were each teaching a semester abroad in Spain, albeit at different universities. It was fun to hang out with some English speaking folks because in this town, hearing any English spoken was a real rarity. I was lucky that they invited me to join them for dinner, not only because we had a great time together, but also because if I had dined solo, I would have been unable to order the signature lamb dish of the region, which is served family style. The lamb, by the way, was out of this world tender and flavorful and matched the house Tempranillo beautifully. Unfortunately, I didn't get a photo of the lovely British couple, Howard and Linda, whom I shared some wine with the following evening at the Hotel Aranda bar. They are a charming and refined couple who have traveled around the world. Now retired, they've settled in what sounds like a heavenly seaside community not far from Grenada. I was so exhausted after a day of touring that I didn't realize until later that Howard had picked up my tab. Cheers to both of you & I would be happy if our paths crossed again on my continent or yours! 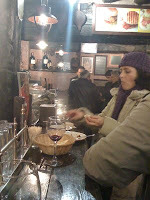 Logrono is the capital of the Rioja wine region and a busy, dynamic city. On Calle Laurel, you can hit about a dozen of the best tapas places in town. 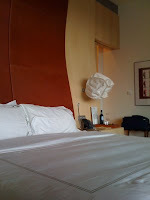 Here's a shot of the bed in my first class room at the Marques de Riscal resort, designed by renowned Canadian architect Frank Gehry. 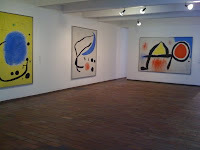 During my brief time in Barcelona, my favorite tourist destination was the Fundacion Joan Miro, where I reveled in the inventive artist's dreamy work. 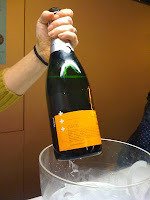 Gabriella Opaz of Catavino took me out on the town in Barcelona, including stopping in a hot spot where she introduced me to a cava (Spanish sparkling wine) that I really enjoyed: Mestres. 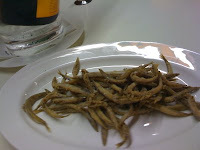 We ate far-out tapas like these deep fried baby eels. Well, that's all the blogging for now. Today I have to settle down and organize writing a chapter for my book about wine travel. Salut! Had a great time Diane and look forward to your next visit! And our offer extends to anyone visiting Barcelona. If you're interested in meeting up for tapas just drop us a line! 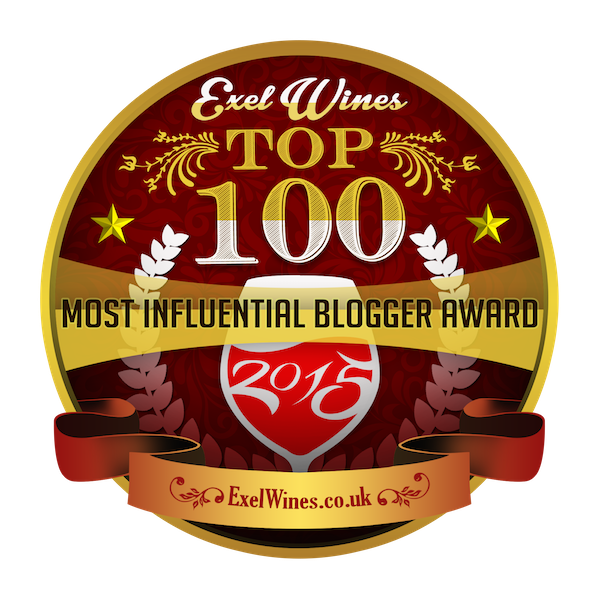 Gabriella, Thanks for stopping by the blog! And, dear readers, she means it when she says that she and Ryan (her life/Catavino partner)will meet up with you in BCN--an invitation not to be missed.